Gutter systems in North America have come a long way since their invention. They have taken on different shapes, different patterns but they are always designed to collect. The word ‘eavestrough’ is tough to spell and even harder to take care of. By guiding water away from the surface of your property, your gutters limit water-related damage and even flooding. So, what happens when this system becomes blocked up or clogged? With routine maintenance and our Burlington gutter cleaning service, you never have to know! Whether you are currently have a blocked system or are just trying to prevent one, our Gorillas can help. Dealing with your property from top to bottom is easier said than done. Every so often, you might glimpse a cluttered roof but probably won’t give much thought to where it goes. Some of this clutter will blow off the surface of your roof but the majority of it will end up in your eavestrough. It might be easy for junk and debris to find its way in, but getting it out can be complicated. Instead of dealing with a headache, call our Gorillas to make your Burlington eavestrough cleaning easy. When ladders rest up against your eavestrough and downspouts they can bend, bow and even drag these materials away. It is a lot more costly to replace an entire gutter system than it is to have a professional service clean it out for you. 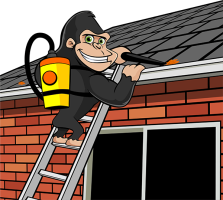 Our Gorilla technicians approach each and every Burlington gutter cleaning in the safest way possible, using proper tie-offs and techniques to ensure the safety of our technicians and your property. Once we have a birds eye view of your gutter system, there is nothing standing between our paws and a clean and flowing drainage system. Contrary to popular belief, your Burlington gutter cleaning requires more than a hand-operated technique. That is why our Gorillas use vacuums to reach even the covered spaces of your gutter system. By cleaning out your gutter system, you are reducing the risk of damage to your roof, leaks, water damage, flooring and even infestation. What’s not to love? When we are carrying out your Burlington eavestrough cleaning, we work safely and effectively. Your system is tested for drainage before we call it a day, and before and after photos are provided to show you just how clean your eavestrough can be!